superstars, originally uploaded by bill kralovec. 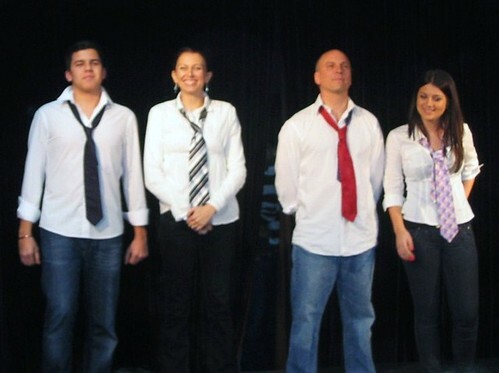 Last Friday night I made my acting debut in our school’s Improvisational Theater event. “Night of the Stars” was performed in the high school performing arts studio. The ISB Thespian Society sponsored the event and it was open to parents, students, and teachers. I formed a team with a couple of students (Marko and Bjanka) and a colleague, (Susie) and we had a great time. We didn’t win, but I learned a lot about the short form improv theater. Our theater director, Patty, gave us various scenarios, rules, etc for four rounds. One needs to listen intently, think quickly, and react to your teammates. There was a nice crowd at the event with a happy group of community members. We tried to entertain them. A big thank you to my teammates for helping me out. They were all experienced actors and guided this novice along. We weren’t exactly ready for “Whose Line Is It?” but we didn’t embarrass ourselves too much.